Santa Margherita Ligure: A few hours separate us from the start of the Regate Pirelli – Trofeo Carlo Negri in Santa Margherita Ligure, Italy, organized by the Yacht Club Italiano, the opening event of the Quebramar GP42 Cup 2008. 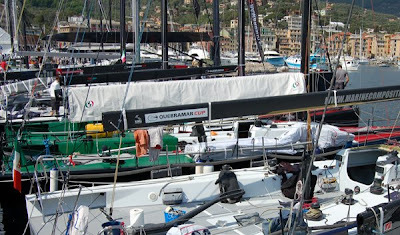 The line up for the inaugural event of the Quebramar GP42 Cup 2008 is impressive and scores of America’s Cup and Olympic sailors will be racing on the waters of the beautiful bay of Santa Margherita. All boats are now side by side on the Italian city’s yacht club pier and despite the cold and rainy weather, shore crews are putting the final touches on the GP42 yachts in order to have them race ready for tomorrow, Thursday, first day of the event.